Carrilladas happen to be one of our favourite tapa choices in Granada, and it really is such a simple dish to make. It is also delicious and warming and perfect with a cheesy, creamy helping of gratin dauphinois. 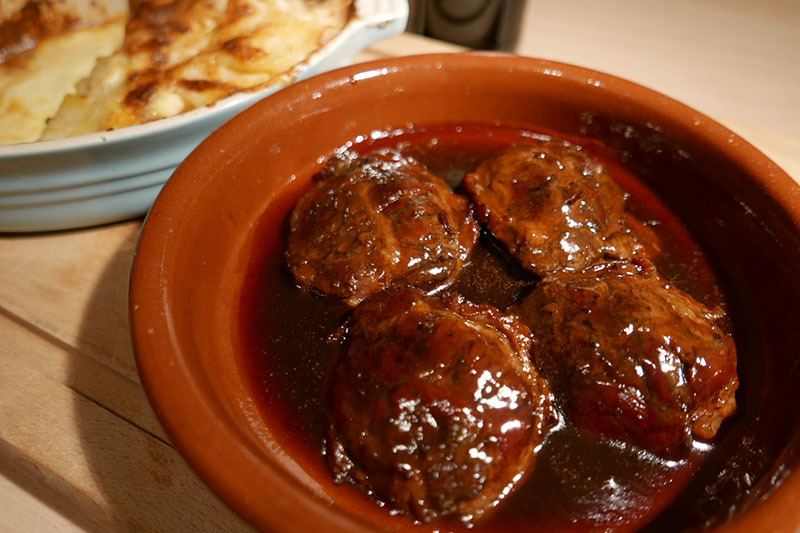 All you need to do is braise the pigs’ cheeks in Pedro Ximénez (the sweetest of the sherries) and stock and then reduce the gorgeous sauce just before serving. In a solid saucepan, heat the olive oil (around 4 tablespoons) and when it is hot, add the pigs’ cheeks. Season with salt and pepper and brown well before adding the cloves of garlic. Pour in the Pedro Ximénez followed by the beef stock, bring to a simmer and then cover with a lid. You can then go off and do something else, leaving the cheeks to simmer for around 3 hours. They need to cook slowly until they are beautifully tender. During the cooking, if there is any stock left over, you can add this to the pan to ensure that there is plenty of liquid. Once the cheeks are tender (err on the longer side of the 3 hour cooking time! ), remove them from the pan and set aside while you reduce the sauce. Turn up the heat and remove the lid letting the liquid boil down until you are left with a thick, glossy and sumptuous glaze-like sauce. Keep an eye on this, as once it starts to reduce it boils down very quickly! Place the cheeks back in the sauce to coat them then serve with the luxuriant creamy, cheesy potatoes. There is nothing like this for a cold winter’s evening. PS…if you’d like our recipe for Gratin Dauphinois, let us know in the comments section below and we will oblige!